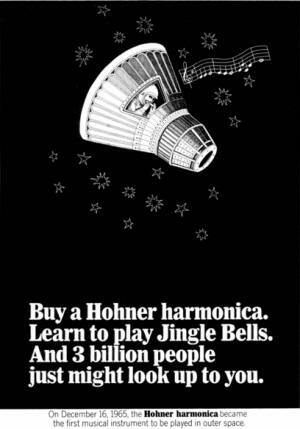 On December 16, 1965, NASA's Gemini 6 astronauts Walter M. "Wally" Schirra Jr. and Thomas P. Stafford conducted the first live musical performance from space. 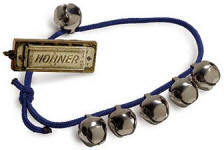 Using a smuggled (reportedly) mini harmonica (Hohner #39 Little Lady) and some reindeer bells, Schirra and Stafford, respectively, radioed a 'UFO' report saying "Gemini VII, this is Gemini VI. We have an object, looks like a satellite going from north to south, up in a polar orbit. He's in a very low trajectory traveling from north to south and has a very high climbing ratio. It looks like it might even be a ... Very low. Looks like he might be going to reenter soon. Stand by one ... You might just let me try to pick up that thing." [see NASA transcript, 23:57:30] Just before reentry into the Earth's atmosphere for a splashdown, the two pranksters then broke out in a round of "Jingle Bells." This being the first flight where the astronauts removed their helmets and relied on capsule pressurization and oxygen allowed the performance to happen. See the TV Guide announcement of regular programming preempting for Gemini 7 launch coverage and the docking with Gemini 6A..